Powerful computer chips, highly efficient infrared LEDs and modern camera sensors now make it possible for previously complex eye-tracking systems to be adapted for consumer applications. These systems enable devices to detect user’s eye movements and recognize what the user would like to do next. In conjunction with established input methods, eye tracking opens up a wealth of new intuitive interactions between man and machine. Eye tracking systems detect a person’s eye movements and the direction in which they are looking. Originally they were developed for market research, behavior analysis and usability studies. Many of these systems use infrared light to illuminate the user’s eyes, take a picture with a camera and calculate eye movement from the image data. Such systems needed special high-quality cameras, light sources and software. Sometimes hardware accelerators were added to process the huge amount of graphic data. Today, extremely powerful chips, compact camera sensors and modern high-power LEDs enable eye-tracking functionality to be integrated in consumer devices such as smartphones. What’s more, in many devices the camera sensor and the infrared light source are already being used for other functions such as facial recognition or iris identification. All that is then needed is an appropriate software to integrate eye tracking as an additional feature. These modern eye-tracking systems are based on infrared LEDs (IREDs) for illuminating the eyes and a high-resolution camera sensor that registers the light reflected by the eyes. Image processing algorithms take this raw data and calculate the positions of the pupils. Using information about the position of a reference object, such as the screen, special software is able to determine where exactly the user is looking. Infrared illumination guarantees the necessary contrast between the iris and the pupil, whatever the eye color, particularly in the dark or if the screen background is very bright. Such systems currently have a range of up to one meter. For smartphones and tablets the typical working distance is around 30 cm, for desktop computers around 60 cm. The resolution on the screen corresponds to the raster size of the eyes and is about 1 cm for tablets and about 2 cm for computers. The number of IREDs used and the specific arrangement of emitters and camera depend on the type of application, in other words on the working distance and the size of the area to be covered. The setup can also vary with the eye-tracking software used because the geometry of the design depends also on the ability of the algorithms to reliably detect the orientation of the pupils. Generally speaking, the emitter and camera sensor have to be arranged at a certain angle and at a certain distance with respect to one another to avoid glare from spectacles or direct reflections from the eyes to the sensor. The greater this distance, the better the signal quality and the more flexible the choice of the optimum distance between the user and the device. For such applications Osram has developed the Oslon Black Series and has achieved a record efficiency of 48 percent with SFH 4715A. 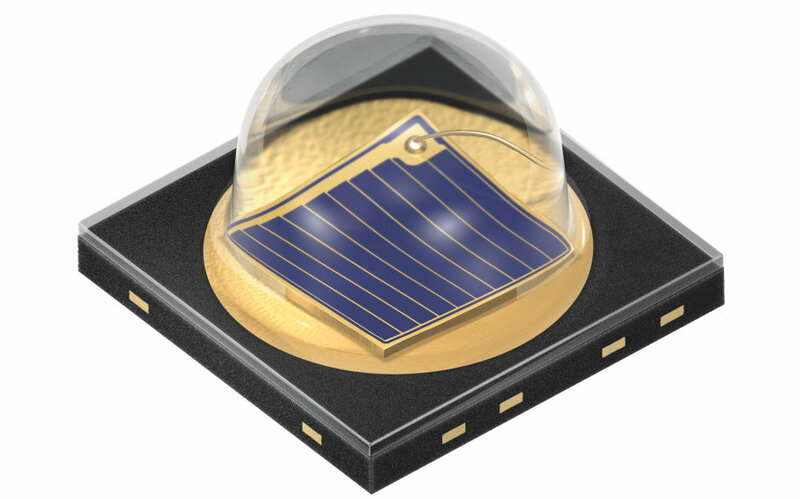 The 850 nm emitter typically delivers an optical output of 770 mW at 1 A and at present it is the most efficient IRED at this operating current. Even higher outputs are achieved by stack versions in which two emission centers are provided per chip with the aid of nanostack technology. SFH 4715AS typically produces 1340 mW of light at a current of 1 A. Two versions with emission angles of 90 and 150 degrees cover a wide range of different designs. The Oslon Black version with an optical output of 990 mW at 1 A is ideal as a 940 nm light source. A particular feature of the Oslon Black is the low component height of only 2.3 mm. This IRED therefore fits not only in present-day smartphones but also in the next generation of devices despite the trend toward thinner devices. © 2019, OSRAM Opto Semiconductors GmbH. Wszelkie prawa zastrzeżone.